Kate Morgan Meal Replacement Shake sachets are heavily fortified with all of the vitamins and minerals that your body needs to stay healthy while you lose weight. They are part of a nutritionally balanced weight loss program and taste great, keeping you fuller for longer. Contents of one sachet replaces one meal. SKU: KM3070O. Categories: Shakes, Shake Packs. Add 200 – 250 mL of cold water to a Shaker. Add the contents of a Kate Morgan Sachet and shake until the contents of the sachet are fully dissolved. Add more or less water to suit your taste. 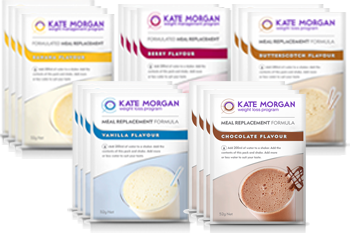 Simply replace two meals a day with Kate Morgan Meal Replacement Shakes, Bars, European Cremes or Soups. Enjoy one healthy meal and 1 snack per day. Milk Solids, Fructose, Maltodextrin, cocoa powder (2.5%), thickeners (407, 1442, 415), vegetable oil, glucose syrup solids, flavour, Minerals (Magnesium Oxide, Ferrous Sulphate, Zinc Sulphate, Potassium Iodine), Vitamins (C, E, Niacin, A, D, B6, B1, B2, B12, Folate), emulsifiers (471, soy lecithin). Contains Ingredients Derived From Milk, Wheat & Soy.